Congratulations to Magdalena Murawska for obtaining a Marie Skłodowska-Curie Individual Fellowship from the Research Fellowship Programme programme of the European Union. The 24-months postdoctoral fellowship will allow Magdalena to do identify novel regulators and interactors for the chaperone FACT that target its functions to heterochromatin using functional genomics and proteomics. Our post-doctoral fellow Aurelio Nardozza was recently awarded with the prestigious Marie Skłodowska-Curie Individual Fellowship from the Research Fellowship Programme programme of the European Union. He will get funding for his research in our department for the next two years - Congratulations Aurelio! Welcome to our Assistant Professor Prof. Dr. Michaela Smolle! Since February 03, 2014, she is an independent group leader in the department. Michaela did her postdoctoral work in the laboratory of Jerry L. Workman at the Stowers Institute for Medical Research in Kansas/USA. Her group uses a multidisciplinary approach to study transcription and chromatin organisation in budding yeast, including modern genomics and proteomics combined with genetic, biochemical and biophysical approaches. David Arnosti, Professor for Biochemistry and Molecular Biology at the Michigan State University/USA, spent three months in our department as a visiting guest scientist supported by the LMU Center of Advanced Studies. In this newsletter article he and Andreas Ladurner explain recent observations on the molecular basis of learning and memory. In this issue of Cell Reports (Cell Reports, October 2013) we describe the development and the validation of a novel and broadly applicable biochemical procedure: CAST-ChIP (chromatin affinity purification from specific cell types by chromatin immunoprecipitation). CAST-ChIP powerfully identifies cell-type-specific as well as cell-type-invariant chromatin states, enabling the systematic dissection of chromatin structure and gene regulation within complex tissues such as the brain. Our study identifies H2A.Z as an active chromatin signature that is refractory to changes across cell fates. In the June issue of Cell (Cell, 6 June 2013), we report crystal structures of full-length Drosophila Cryptochrom (dCRY), a dCRY loop deletion construct, and the photolyase homology region of mouse CRY1. We show that the FAD and antenna chromophore-binding regions, a predicted coiled-coil helix, the C-terminal lid, and charged surfaces are involved in FAD-independent mPER2 and FBXL3 binding and mCLOCK/mBMAL1 transcriptional repression. The structure of a mammalian cryptochrome1 protein may catalyze the development of CRY chemical probes and the design of therapeutic metabolic modulators. In this recent Nature Letter (Nature, 2013), we report the crystal structure of the evolutionarily conserved FACT chaperone domain Spt16M in complex with the H2A–H2B heterodimer, shedding light on how the complex promotes the activity of enzymes that require nucleosome reorganization. In two studies (Nature Structural & Molecular Biology, 2013 and The EMBO Journal, 2013), we identify crucial enzymes that are involved in the process of quickly alerting the cellular defense and repair system. We describe a family of macrodomain enzymes present in viruses, yeast and animals that reverse cellular ADP-ribosylation by acting on mono-ADP-ribosylated substrates. The DFG funded Excellence Cluster for Systems Neurology (SyNergy) has started. Prof. Andreas Ladurner is one of 25 principal investigators. 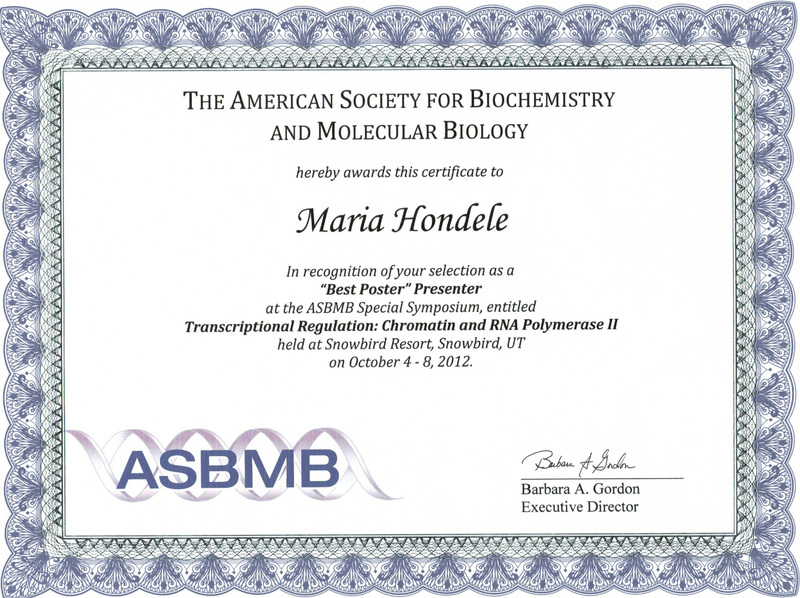 Best Poster: The American Society for Biochemistry and Molecular Biology awarded Maria Hondele the first prize for "Best Poster" Presenter at the ASBMB Special Symposium on "Transcriptional Regulation: Chromatin and RNA polymerase II". Prof. Andreas Ladurner has been elected as a new member of EMBO! Among other life scientists from Europe and around the world, he was recognised by EMBO for his excellence in research. Prof. Andreas Ladurner is a new member of BioSysNet. The Bavarian State Ministry of Sciences, Research and the Arts awarded Prof. Andreas Ladurner a senior grant within the Bavarian Science Network for Molecular Biosystems (BioSysNet). In a recently published article, Prof. Andreas Ladurner talks about epigenetics and describes the enormous potential that lies witihin the epigenetic information. Read the recent article on Prof. Andreas Ladurner in the January, 2012 issue of the LMU Munich University Magazin. 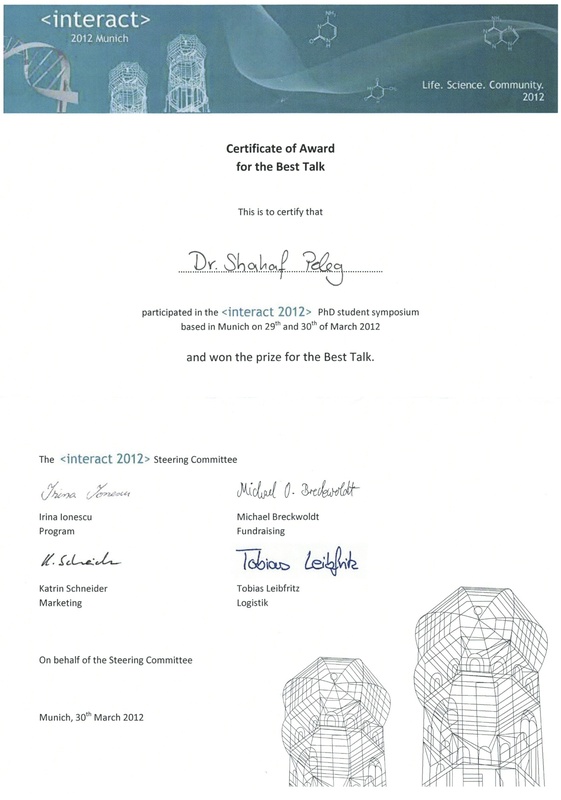 <interact> symposium in Munich 2012: Dr. Shahaf Peleg won the prize for the Best Talk! Welcome to our new research group leader Dr. Sigurd Braun! Since February 15, 2012, he is an independent group leader in the department. Sigurd did his postdoctoral work in the laboratory of Hiten Madhani at the University of California, San Francisco. His group is studying the regulatory networks of heterochromatin formation in the model organism Schizosaccharomyces pombe. Congratulations to Dr. Andrew Bowman, a postdoctoral fellow in the research group of Prof. Andreas Ladurner. Andrew has been selected by the EMBO Fellowship Committee to be awarded with an EMBO Long-Term Fellowship. With the beginning of the new year 2012, PD Dr. Eva Wolf moved her research group from the MPI Munich to our institute. Her research group focuses on the structural and biochemical characterisation of clock proteins, which are involved in the generation and light synchronization of 24h day-night activity cycles. Dr. Shahaf Peleg is the recipient of the "Schilling Forschungspreis der Neurowissenschaftlichen Gesellschaft 2011". Shahaf's outstanding work on the epigenetic mechanism of histone H4 lysine 12 acetylation in the hippocampus and its implication on the gene expression during the process of learning has been awarded 20.000 EUR. In August 2011, Dr. Sigurd Braun has been selected as a RISE1 (Research Integrating Systems biology in Epigenetics) member of the Epigenesys Network of Excellence. Sigurd is among 8 other young scientists being awarded with a prize of 150.000 Euros for 3 years. The Network of Excellence "Epigenesys" is an EC-funded research initiative on epigenetics advancing towards system biology. In May 2011, Dr. Carla Margulies moved her research to our department. Her group addresses the question how the transcriptional mechanisms and changes in chromatin structure are involved in behavioral plasticity. As a model system, her team uses the powerful genetic model Drosophila melanogaster in olfactory associative memory. Since December 15, 2010, Dr. Gyula Timinszky is an independent research group leader in the department. He joined Andreas Ladurner's research team at the EMBL in Heidelberg and he now supervises his own group. His research focus is the regulatory role of poly-ADP-ribosylation (PARylation), an NAD-dependent modification carried out by poly-ADP-ribose polymerases (PARPs). Prof. Dr. Andreas Ladurner is the chair of the department since October, 2010.